The Articles Block can be thought of a more of a listing tool. The lable of article for the "Add Article" link can be changed to reflect any list for instance, a list of quotes, poems, or whitepapers. Settings to change the article lable to another word and more are found under the Articles Block Advanced Options. 3. 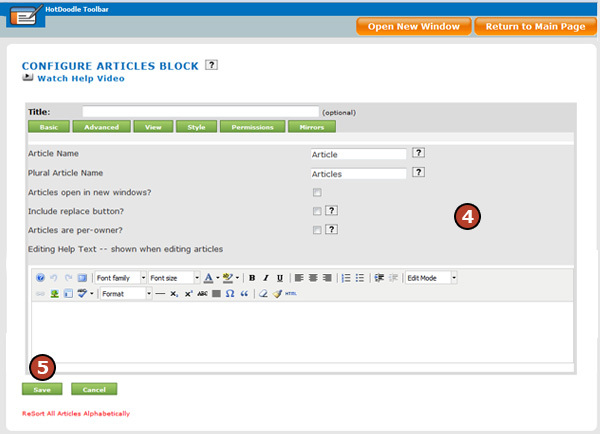 Click on the "Advanced" tab on the Configure Articles Block screen. Article Name - This field allows you to change the word article. Plural Artice Name - This field is to specify the plural of the newly chosen word to replace article. Articles Open in a new window - This setting opens articles in a new window when checked. Include replace button? - This setting allows you to delete all the articles at once without deleting the Articles Block. Articles are per-owner? - This setting allows articles to be owned by the users creating them. Editing Help Text - This setting is to provide text help that will be shown when a user is editing an article.